Torrance was founded on May 31, 1911 by Jared Sidney Torrance and Associates by the purchase of 2,791 acres of land from the Dominguez Estate Company for $976,850. 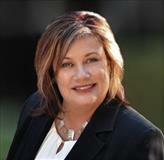 Susana Dominguez del Amo sold an additional 730 acres to Torrance for $350 per acre. This land was originally a small part of the Spanish land grant called Rancho San Pedro, given to Juan Jose Dominguez in 1784 ( See the History of the South Bay for a discussion of the early Spanish land grant ranchos). 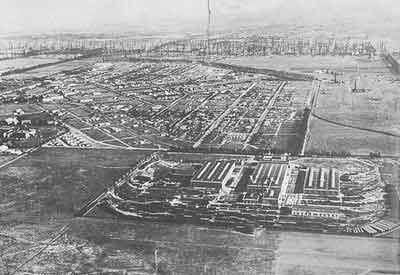 At its inception, this planned industrial town provided housing for 500 people. In March 1912, Torrance had originally proposed that the new development be named "Dominquez". The post office would not allow the use of this name since there was already a post office with that name. On March 12, 1912, at a meeting of the board of directors of The Dominquez Land Company, of which Jared Torrance was President, this issue was discussed, with many variants of the name "Dominquez" discussed. Other names considered included "Southport" ,""Coronel," "Obrador," "Don Manuel" and "Industrial". Finally, over the objections of Jared Torrance, the board approved a resolution naming the new development "Torrance". The city was incorporated in 1921, and had a population of about 1,800 residents. Frederick Law Olmstead, Jr., of Boston, is perhaps the foremost landscape architect of the country, and provided the landscape planning for the Palos Verdes Project. Millions of exposition visitors have seen and admired his work. Olmstead laid out the new industrial community of Torrance. On the broad empty cornfield he traced the lines of streets and boulevards, marked the limits of the business district, placed the industrial sites in the lee of the town, away from the prevailing westerly breeze, chose a knoll for the civic center, designated the sites of the city hall, library, auditorium and other public buildings, backed his civic center with a thirty-acre park and, fixing his eyes firmly upon the white peak of Mt. San Antonio at the horizon, laid out a broad boulevard straight through the business center toward the snowy crest. He devised winding contour streets and straight ones, provided diagonals, chose the trees, palms and shrubs for the parking spaces and told the engineer to go ahead. H.H. Sinclair, the chief, did go ahead, whipped the Olmstead plans into practical shape and broke the record for speedy, thorough construction. This industrial city was to be the crowning achievement of Jared Torrance's long career filled with constructive effort. It was to prove that a worker decently, pleasantly housed upon an ample plot of ground of his own increases in efficiency and contentment, that these qualities are most important industrial assets and that their growth could be stimulated by laying the groundwork of a model city. To this end the individual home was fostered by him and protected by prohibiting the erection of any structure save private dwelling in the residence districts, by a complete separation of business houses from the home neighborhoods, by setting aside certain areas for livery stables, lumber yards, blacksmith shops and similar unsightly plants, by preventing the encroachment of the industrial zone upon the dwellings and by strict regulations, running with the land, against the manufacture or sale of intoxicants. In addition, Torrance gave the individual home site a minimum width of forty feet, and a depth of a hundred and forty feet, which was much larger than most home sites on the east coast. The Pacific Electric Railway depot in Torrance is shown in this photo taken between 1912 and 1916. The discovery of oil brought the initial development of Torrance. The first oil well was dug in December 1921, and it was a gusher. The discovery of oil increased the population of Torrance from 1,800 at its founding in 1921 to 2,750 in 1922. Soon, there were oil derricks throughout the city. By June, 1925, there were 582 producing oil wells in Torrance. Louis was an attorney by training who practiced in western Nebraska. After having lost his voice by too many years of “lawyering” and having suffered from kidney disease and other intestinal ailments, like many others at the time, moved to Southern California to try and regain his health. 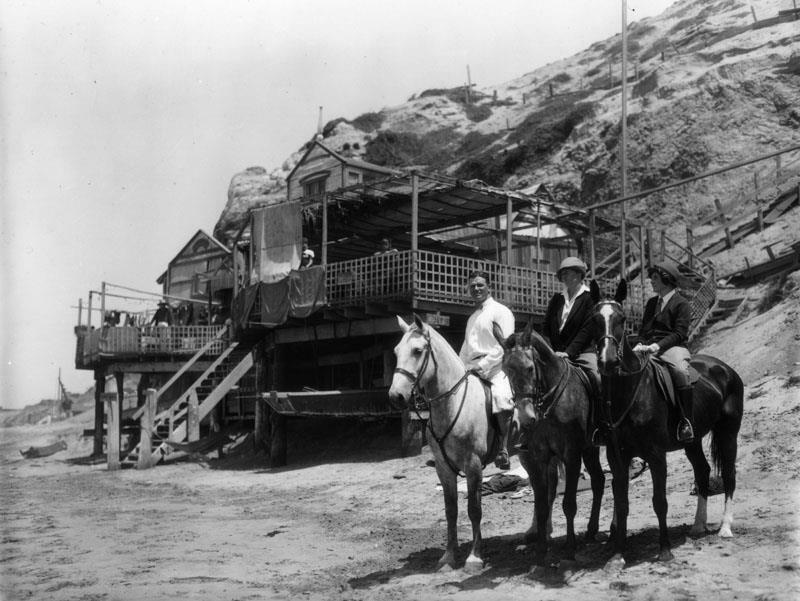 After working at several jobs at local ranchos, he went to the shoreline just south of the area known as Clifton-by-the-sea in Redondo Beach below the area later developed as Hollywood Riviera. There he found an old tent, and exhausted and deathly ill, stayed to die. Soon after, an old Mexican woman told him that the waters of the fresh water spring at the base of the cliff bluffs had healing powers. For a month, he lived only on the spring water. He then found some wild tomatoes at the top of the bluffs and lived for quite a while only on a broth of tomatoes and snails. Over that time, he miraculously regained his health and began to build his castle from driftwood and other materials he found on the beach. The port of Redondo was very active transporting materials, some of which found their way overboard drifting to shore. Louis stated that he only spent 20 cents on nails for an emergency and that all of the other materials were delivered to him by “Neptune’s White Horses”. On Thanksgiving in 1920, a 45 foot yacht named “Genevieve” moored just offshore, and winds that night broke her moorings and dashed the yacht on the rocks on the beach. The owners of the yacht paid Louis $5 to watch over the yacht overnight and then offered numerous items to him for helping them salvage the remains of the yacht. Many of these items found their way into the castle including an old galley stove whose remains slowly washed up on the shore over a two year period. Louis expanded the castle over the next several years finally reaching 4 stories in height. An old sign hung over the entrance reading “This building cost but little money but much work without which life affords no satisfying kick”. Another sign read “My family-outside its appetite-is not so very big-Just a brindle Thomas cat and a black-nosed guinea pig”. Over the years, the castle became popular with visitors and Louis raised money by selling soft drinks (cooled by a cooler fed by the spring), cigarettes, candy, and even started to bake and sell thousands of pies. 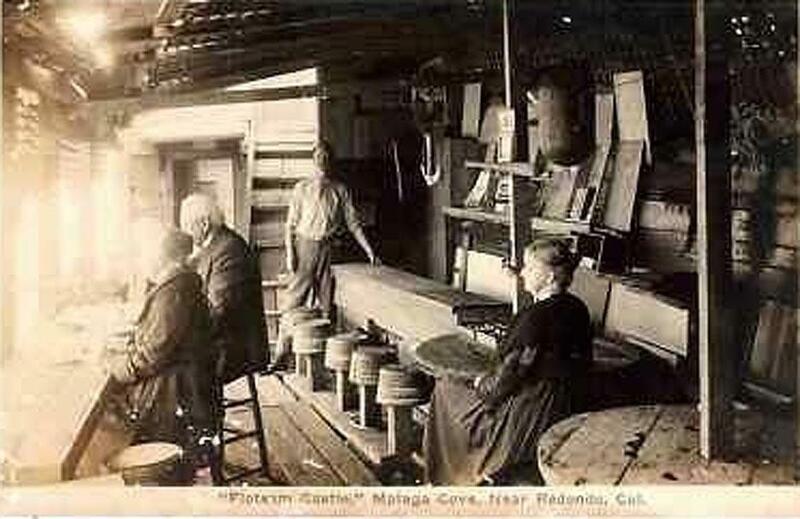 Several other drift-wood homes were also built south of Louis’ castle during the 1920’s, with one referred to as a "Japanese fishing shack". After abandoning the castle sometime after 1925 and moving to Riverside, the developers of the Hollywood Riviera project burned the house down in May 1930. Louis Dart died on March 3, 1932. "The original tract of land for Torrance consisted of about one square mile when the city was founded in 1912 by Jared Sydney Torrance. Torrance wasn't incorporated until May 21, 1921. At the time of incorporation, the city's area had increased to 3.82 square miles in the area now known as Old Torrance. The 1920s brought about rapid expansion for the city. Five major chunks of land and one minor one were added to Torrance between 1926 and 1931. 1. Northwest Torrance, Feb. 9, 1926. 4.14 square miles including much of the western part of the city. 2. Meadow Park, Jsn. 18, 1927. The largest tract annexed by the city at 5.91 square miles, it included South Torrance from Lomita to Torrance Beach. 3. Walteria, March 12, 1928. 0.39 square miles. 4. Helbush, Sept. 10, 1929. A very small 6-acre tract on the eastern edge of the Meadow Park tract. 5. McDonald, June 2. 1930. 3.68 square miles. North Torrance. 6. South Torrance, May 26, 1931. 0.94 square miles that include Southeast Torrance as it wraps around the northern Lomita border. 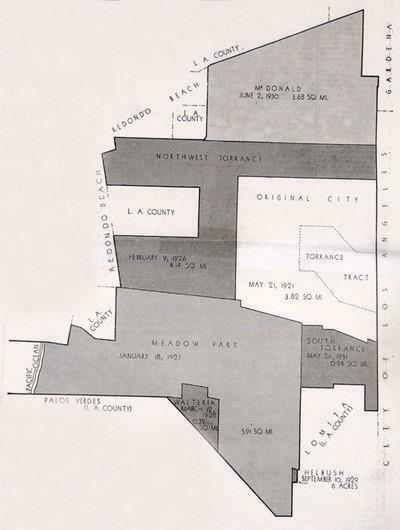 After the 1931 South Torrance tract was annexed, Torrance's total area had mushroomed to 18.88 square miles, almost five times the size of the city as it was incorporated in 1921. Annexations since 1931, including the Victor tract in West Torrance added in 1956 after a tussle with Redondo Beach, have increased Torrance's area to 21 square miles. Of course, not all of Torrance's annexation attempts have been successful. But many of them have been colorful. Attempts to annex the Alondra Park and El Camino College area just north of the city date back at least to 1951, when a serious bid was launched. It died out by Feb. 1953, but not permanently. Another unsuccessful bid sprang up in 1959, and continued through the early 1960s without success. Councilman Dan Walker then revived the idea of annexing the college, park and golf course in Feb. 1992, and, as mayor, Walker tried again in Aug. 2002, but the annexation never became reality. The 1800-acre area near Crenshaw Blvd. south of the city that was once the Great Lakes Carbon diatomaceous earth mining operation and now contains the South Coast Botanic Garden has been a topic of annexation talks since the 1950s as well, but remains county land. The size of the parcel under consideration had dropped to 370 acres by the time Torrance withdrew its interest in March 1979. Other quixotic Torrance annexation attempts include a very friendly overture by the city council toward Rolling Hills on Jan. 12, 1954 that received a chilly reception. This attempt eventually blossomed into an unsuccessful three-year effort to annex a 10-square mile area of the Palos Verdes Peninsula. A new effort was launched in Dec. 1956. This time the target was the as-yet-unincorporated city of Lomita, with Rolling Hills again thrown into the bargain by the ever-persistent Torrance. Accusations of "land-grab" flew, and Lomita fought the move for years before finally incorporating as an independent city on June 30, 1964. Things just got silly in Jan. 1957, when some Torrance council members suggested that annexing Redondo Beach wouldn't be such a bad idea. Redondo Beach officials could barely suppress their laughter. Then-councilman William Czuleger, who was considering a run for mayor, told reporters, "Just say I'm taking out papers for Isen's job," when asked if his Redondo Beach mayoral candidacy was official. 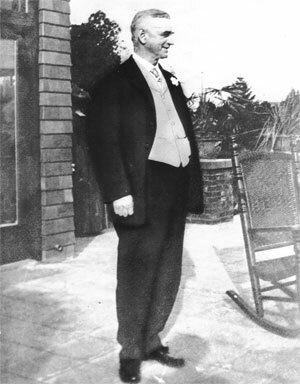 Albert Isen was then the mayor of Torrance. The two cities jousted for a few months over the relative ridiculousness of the proposal, but nothing serious ever came of it." The original Torrance city charter was voted on and ratified by a vote of the people on August 20, 1946, and filed with the California Secretary of State on January 7, 1947. The discovery of oil, a second planned industrial expansion, and land annexations marked early development and paved the way for Torrance to become one of the largest cities on Los Angeles County today with a population of about 136,700. Hollywood Riviera is an area located in both Redondo Beach and Torrance at the base of the Palos Verdes Peninsula. The Hollywood Riviera was initially developed by Clifford Reid.Clifford Reid was fascinated by the motion picture industry, and when he first viewed the area he compared it to the French Riviera. He believed that it would be very attractive to the Hollywood crowd, thus naming it Hollywood Riviera. 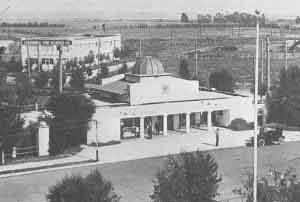 A tract sales office was built at the comer of Monte D'Oro and Palos Verdes Boulevard, which included a large dining hall and lecture hall built behind the office for sales presentations. Reid began selling lots in the 604 acre development in 1927 for the Huntington Land Company for about $3,500 . Reid’s plan to attract movie stars to buy lots was severely impacted by the Depression, and the development’s anti-Semitic policies, which prohibited Hollywood elites such as Louis B. Mayer and Sam Goldwyn from owning property there. For the History of the Hollywood Riviera Beach Club, see the bottom part of my History of Redondo Beach web page.